You know about Pirates of the Caribbean and Treasure Island. 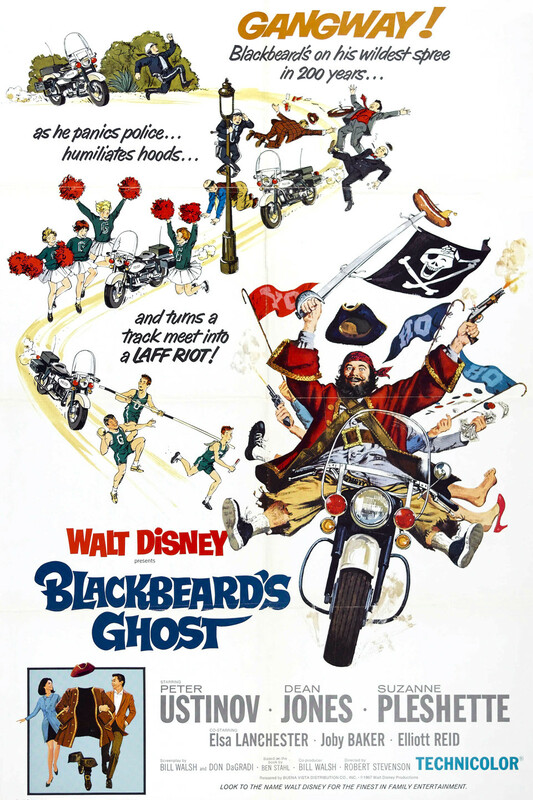 In this episode of our nautical film podcast, David and I are joined by our friend Rob Graham to talk about the other Disney pirate film, starring Dean Jones, Peter Ustinov, Suzanne Pleshette, and Elsa Lanchester. I never saw this one which surprises me since my neighbors had all the tapes of the live action Disney movies that we would watch during sleepovers. Just thinking about the plots of the Disney movies from 60s and 70s feels like they should have been made ten to twenty years earlier. The gag of the ghost that no one else can see or hear feels like something out of "Topper". Funny in the 30s, but now you could solve the awkwardness by pretending to talk to a Bluetooth earpiece! I would have loved to watch this if only for Elsa Lancaster. Some years back I saw her back to back roles as the fussy maid in Witness for the Prosecution and The Spiral Staircase. It was a Mystery Movie Night episode in the making! The ghost meme is one that gets revisited by Hollywood or other media fairly consistently. "Topper" (1937) mentioned above, and it had sequels. "Blithe Spirit" (1945) was originally a Noel Coward play IIRC. And also "The Ghost and Mrs Muir" (1947). Good casts in all three, and they all play out a bit differently. "Topper" is the most slap-stick of them, but all have some very good dialog and interactions between the cast. I forgot about Topper. That's a great one. I forget if I mentioned it on the podcast, but Harvey is another one. Harvey is one I need to revisit as well.